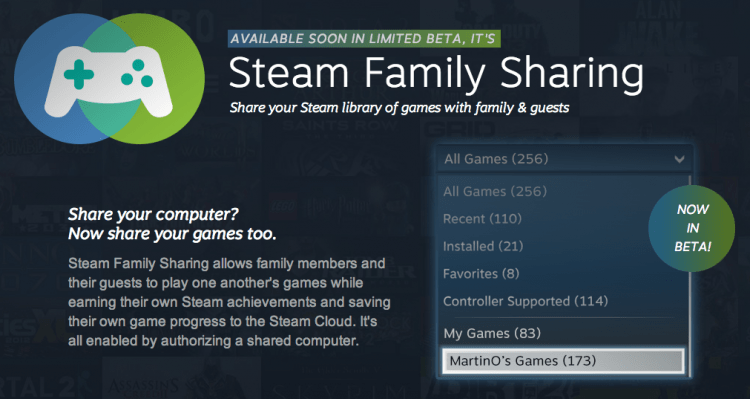 We last reported on Steam Family sharing when Valve announced the program earlier this month. The company said the service would be entering beta shortly, and now select users have been contacted via email on how to get started. Steam Family Sharing is a convenient new feature that will allow Steam users to share their game library with up to 10 friends and family members. Your network of selected Steam users can then access your games free of charge, including any associated DLC. Those users can even have their own cloud saves and achievements. To avoid any complications, only one user can access a single instance of a game at once, with the owner taking priority. The first 1000 users were invited when the beta launched and an additional 2000 invitations were sent out as of yesterday, according to a post on the Steam community group. It looks as though more participants will continue to be added throughout the course of the beta. To get in-line with the other 230K members, head over to Steam and join the Family Sharing group. Valve has been making some major announcements this week including its Linux based SteamOS that is aimed at bringing Steam's platform to your living room and the long awaited Steam Machines. The company is working with several other partners to bring Steam boxes to market sometime next year, with around 300 units being shipped for testing. Valve is expected to reveal the last of the three-phase announcement sometime today.